What makes a disease real? Why is it that patients with chronic fatigue syndrome or fibromyalgia are doubted when they say they are in pain, and cannot access the same benefits of patient-hood that others can? What defines the limits of our belief and, ultimately, compassion, when it comes to disease? These are the questions approached in this book, which draws upon patients’ experiences and situates them among a diverse set of literatures, from the history and philosophy of medicine to the sociology of health and disease. The question of a patient’s identity and their understanding of disease is often assumed to emerge from their relationship with healthcare, but the case is made here that other, inter-personal factors are more salient. What a patient with a contested illness comes up against is not simply a medical categorisation – it is a prevailing notion of disease across society, and one they struggle to assimilate themselves into. 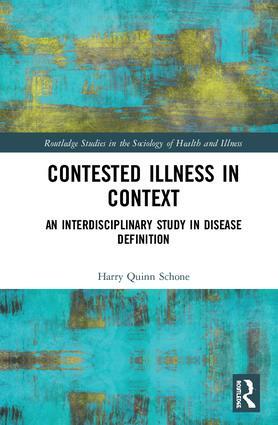 Contested Illness in Context will appeal to students and researchers interested in fields such as the history and philosophy of medicine, the sociology of health and illness, medical anthropology, or disease and illness generally. It may also interest patients and doctors who struggle with difficult medical cases. Harry Quinn Schone brings clarity to the blurry edges of disease, where biology and social factors collide. He is particularly interested in the epistemic conflicts present in contested illnesses, and the consequences of such tussles on patients.